Due to economic and technical reasons, today's engineering and industrial facilities are often built with the combination of prefabricated, large, heavy elements. Heavy Load Lifting offers the most efficient solutions for projects where cranes and conventional lifting equipment cannot be used. 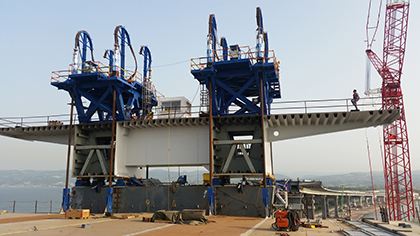 Mega Yapi plans lifting, horizontal movement and lowering works within the framework of the project conditions and designs the necessary temporary structures. The development of equipment and control technologies, new application areas for this method have emerged. Heavy Load Lifting System makes a great contribution to shortening construction time, realizing project goals and reducing costs.